What happens when a collaboration takes place with an arts integrated school and two teaching artists? MAGIC! 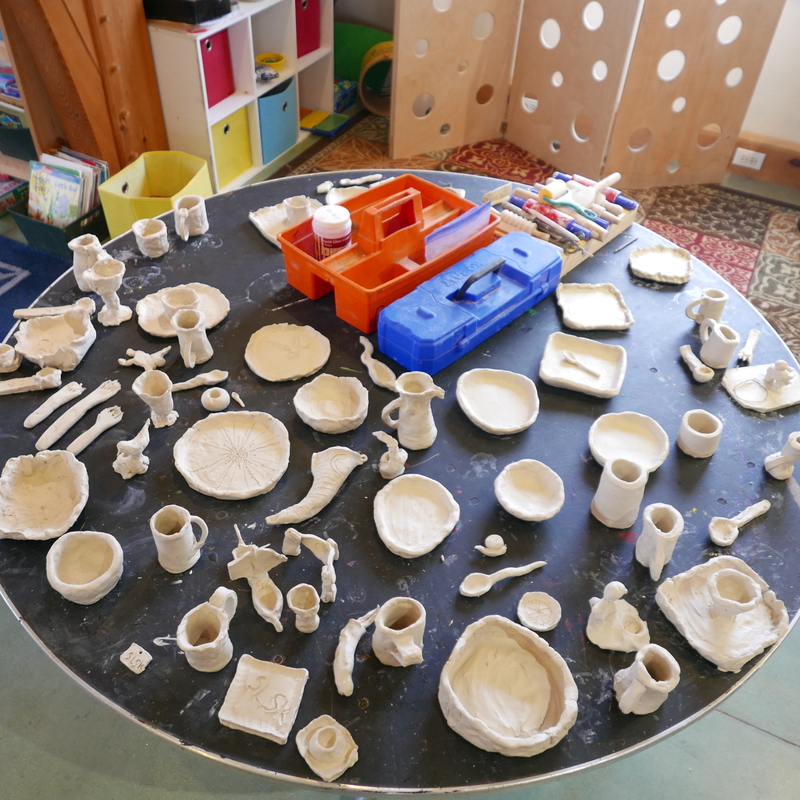 I had the amazing opportunity to be present while young learners were engaged in connecting their learning through pottery and poetry. 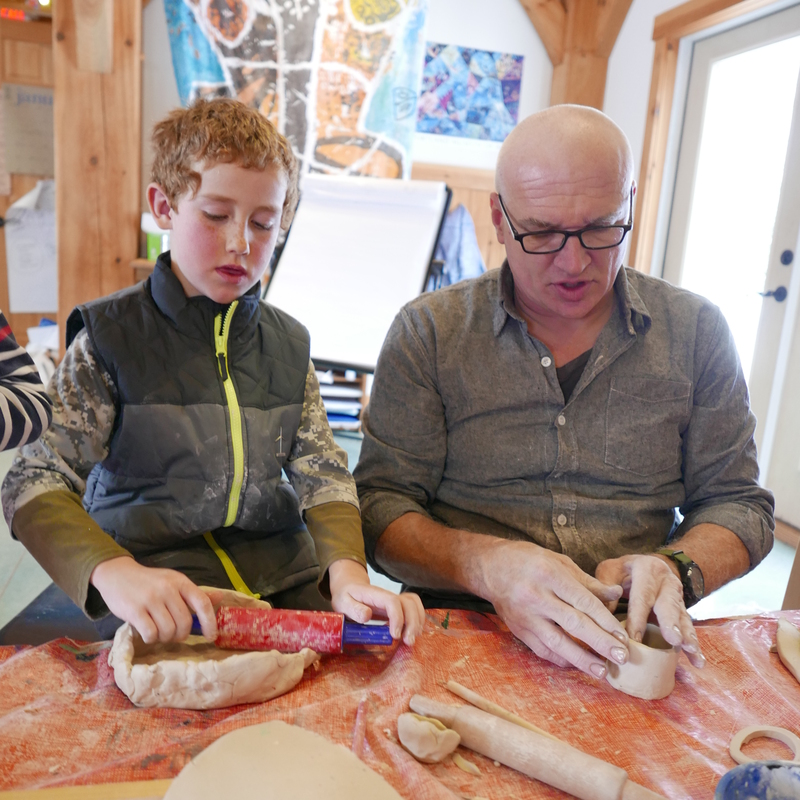 Lindsay Pinchbeck, founder and director of the SweetLand School in Hope invited poet Brian Evans-Jones and potter Tim Christensen to create connected curriculum and learning for the school’s students. Both Brian and Tim are on the Maine Arts Commission (MAC) Teaching Artists roster and are Maine Arts Leadership Initiative (MALI) Teaching Artist Leaders. Lindsay is a member of the MALI Design Team and started her school three years ago. This blog post combines the background information with the participants responses, observations, learnings, and feelings. 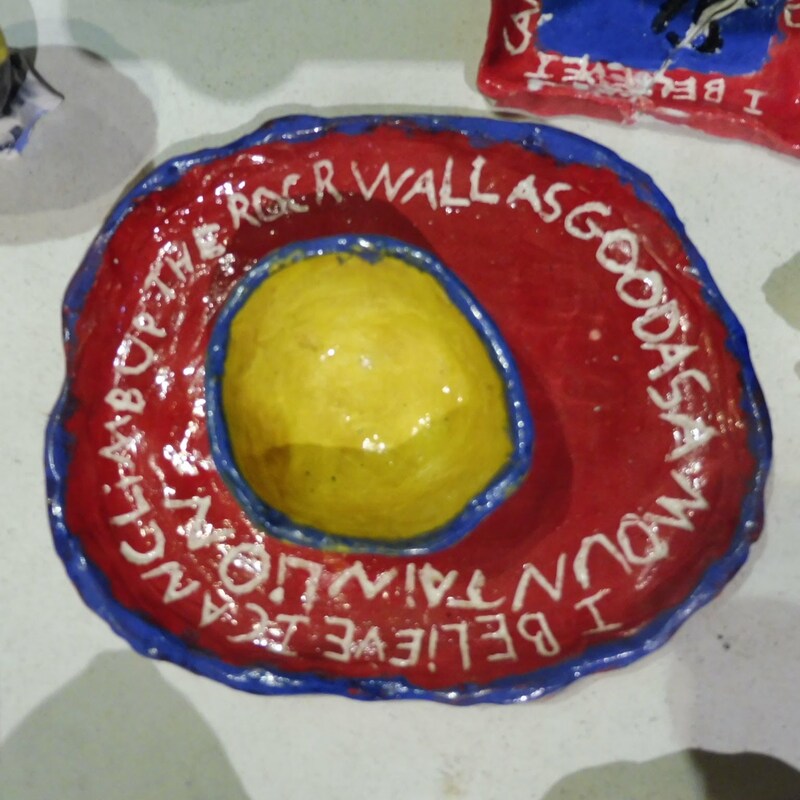 The Sweetland School recently had the good fortune of a residency with ceramist Tim and poet Brian. 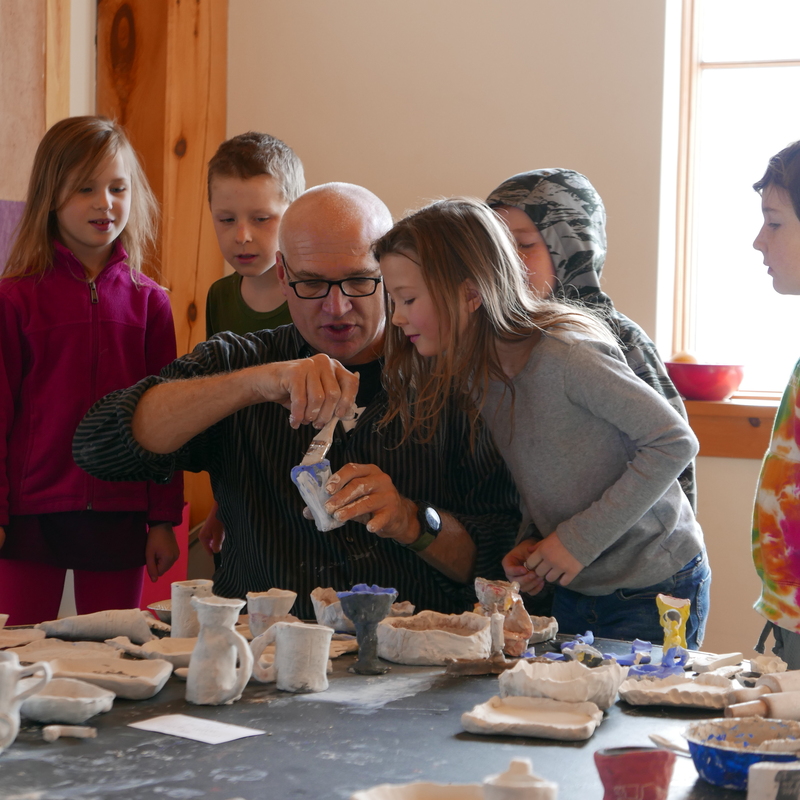 Both artists wove together a program sharing passion and skill in poetry and clay with the children. They created work that knocked all our socks off. Magic was the word tumbling off our tongues this week. For the teachers of Sweetland it was a wonderful opportunity to see the children with fresh eyes. Brian shared a style of poetry called the Anaphora, with repeated lines. 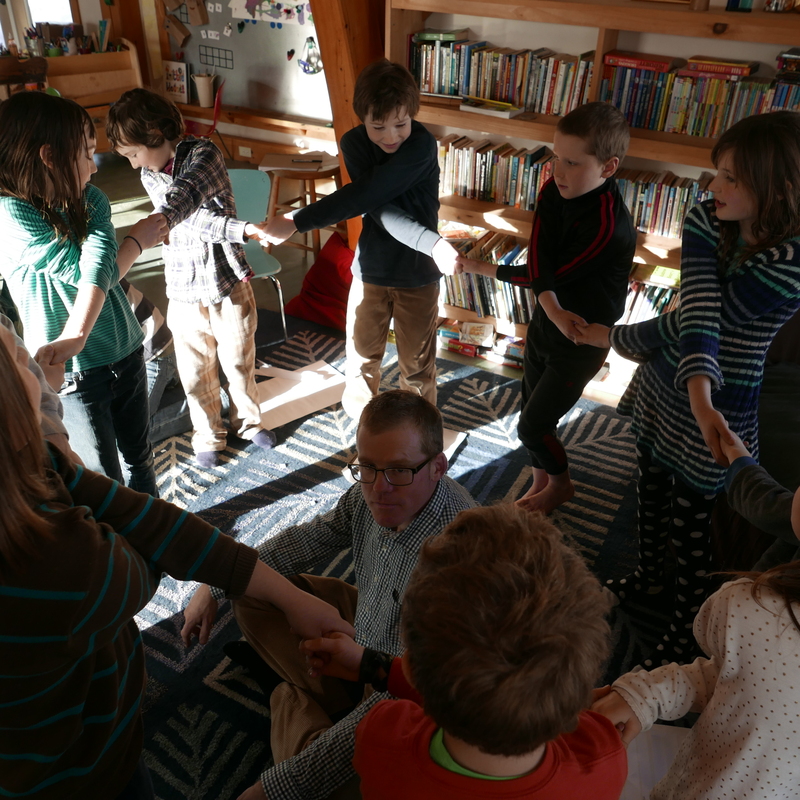 He pushed the children to apply real and imaginary content into their poems. He helped the children generate ideas and then edit and refine their poetry. 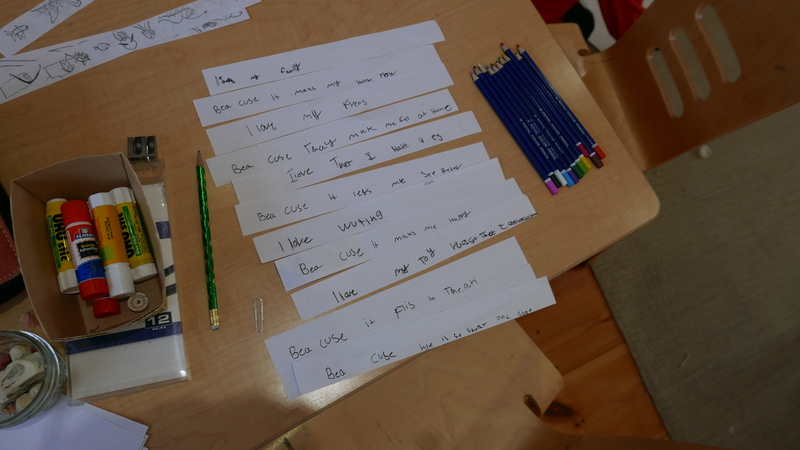 His goal was to support each child to make a 5 line poem, they all generated much more work. I observed writing, reading, sharing, helping one another, public speaking, laughter and pure joy as the children created and shared their work. 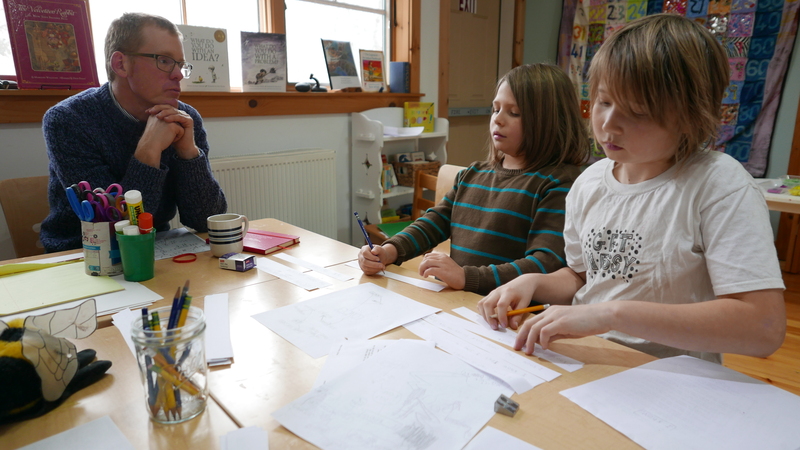 Tim worked in the studio over 4 days with the children to create 5 or so place settings – cups, plates, bowls, even forks and spoons were created. The children took their lines of poetry and added the words from the poetry workshop along with images to each piece. Stories of travel and adventure, wove through their clay making experiences as Tim led the children forward in their pottery explorations. This week I observed a community of learners drive their learning forward. They advocated for what they needed, supported one another, weren’t afraid to ask questions and were giving and thoughtful hosts with our visiting artists. We saw the children at their best, staying focused for long 2 hours sessions in detailed work and generating work they were proud of. The power of visiting artists to inspire cannot be underestimated. 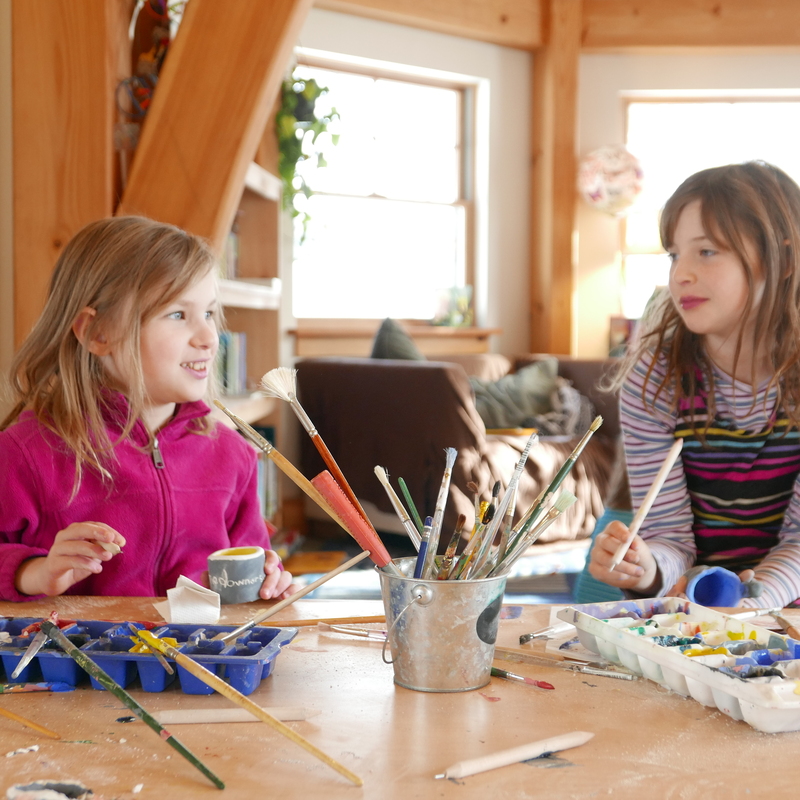 In this safe environment where the children have learned to be themselves and own their ideas they were able to fly with the support of professionals who are passionate about sharing the magic of the process and their craft. We as a staff learned alongside the children and were a community of learners together. To say thank you at the end of their visit the children encircled Brian on Tuesday and Tim on Thursday and sang to both visiting artists. This has officially been termed “Sweetlanded,” by Tim and it’s a pretty magical experience. 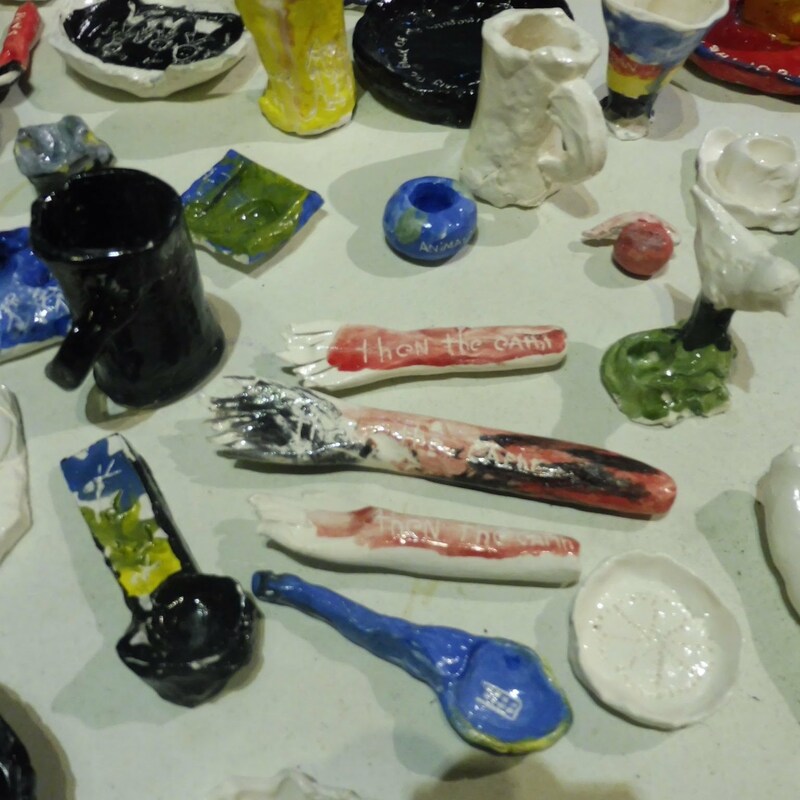 When all the pieces have been fired we plan to have a special celebration of the work at the Hope Library. Thank you Brian and Tim! and a note of thanks to Argy Nestor and the Maine Arts Leadership Initiative where this collaborative residency was hatched. It was a magical experience. This moment felt completely, beautifully appropriate for my experience on the residency. It wasn’t just that the song used anaphora (repeated phrases) to create its structure, which was the technique I had helped them learn for the poems they wrote with me. It was that, through their song and their spontaneous desire to give it to me, they were teaching me something, as they and their school had done all residency. During the previous two days, I had sometimes felt the opposite of deep peace, great happiness, and safety: I had feared that my whole work at the school was going awry. I am not now sure why I felt this way, except that panic and a feeling of ineluctable disaster are often a part of a creative process. But by the students’ continued steady efforts, and I suppose mine too, things had turned out right in the end. Their poems collectively were funny, tender, deeply personal, wildly inventive, and above all wonderful to hear all read out one after another, as they had just done. When I sat in the middle of their voices, I knew that they had given me this moment to teach me that I need not have feared: if you keep working, wisely and with good heart, your projects will succeed. So what I will take away from this residency is a feeling of gratitude, not for what I taught, but for what I learned. I learned that a vision, to create a school where the arts are not peripheral but central, can be made to happen, by Lindsay and her husband Chris. 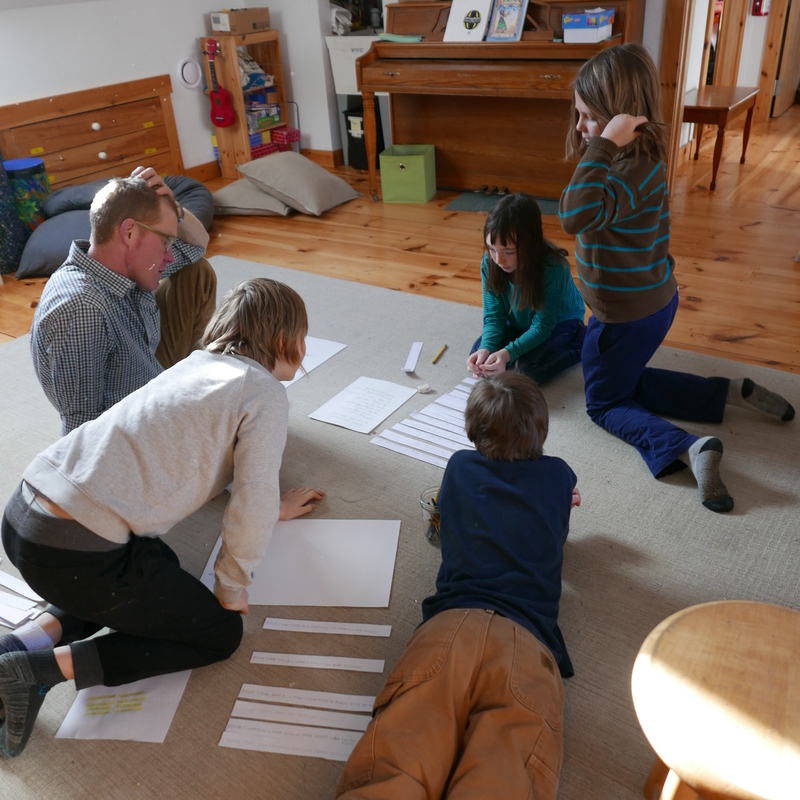 I learned that children who are skillfully supported to trust their own decision-making and imaginations can invent the most marvelous things, such as the spontaneous class play involving sheep and blades of grass that was scripted and performed by the grade 1-3 group, to illustrate concepts of division and remainders, based on a poem they’d made about the number 17. I learned that there is more scope in my own teaching to allow students to make their own choices about how they grow their writing. And I learned a little, just a little, about what can be achieved if we step back, let go of control, and trust the kids, the process, and the art. Watching the children with these visiting artists has been both inspiring and illuminating. They brought their best selves to the work each day, and churned out pieces that are jaw-drop-worthy. One word comes to mind in particular when thinking about their manner throughout this residency: absorbed. Their attention never seemed to wander, their focus remained strong, and their process was steady. The visiting artists were strong guides that brought their wealth of experience effortlessly to the children, openly sharing and encouraging progress and process along the way. The response from the children was eager and positive; the energy of creativity filled the room and excitement and pride about their work bubbled up. It was tangible. Watching the children thank the artists at the end, was perhaps, my favorite part. They circled around each artist, holding hands and sang them a song we sing here at Sweet Tree to celebrate birthdays. A song about creating safety, deep peace and great happiness. This was both instigated and carried out by the students as an offering of gratitude, creating moments that were as beautiful as the work they made this week. For four days, I had the great pleasure to work at Sweetland School. 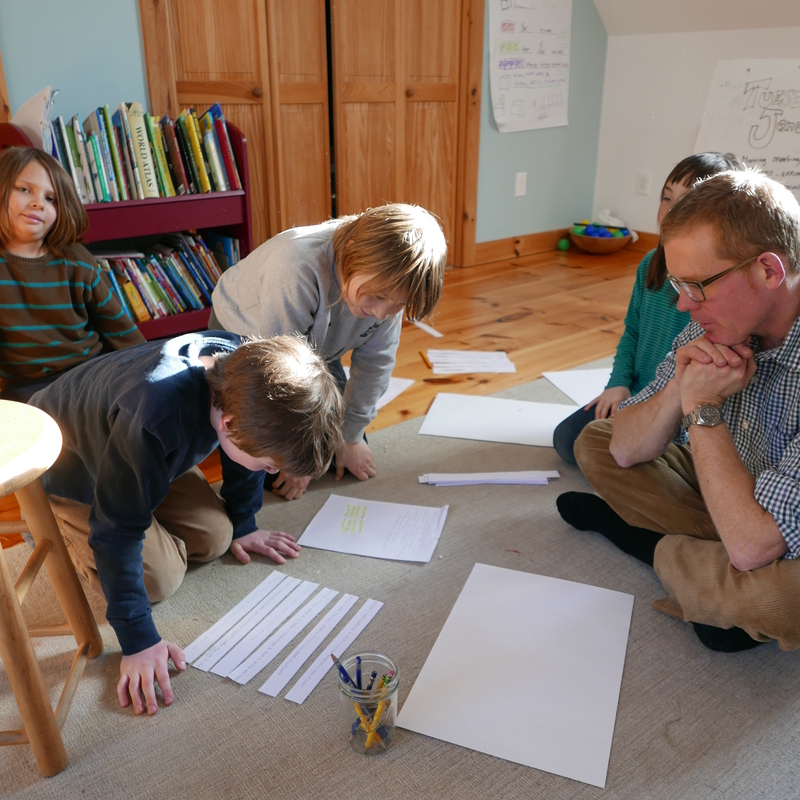 The students wrote poems, working for two days with Brian, an award winning poet from South Berwick. 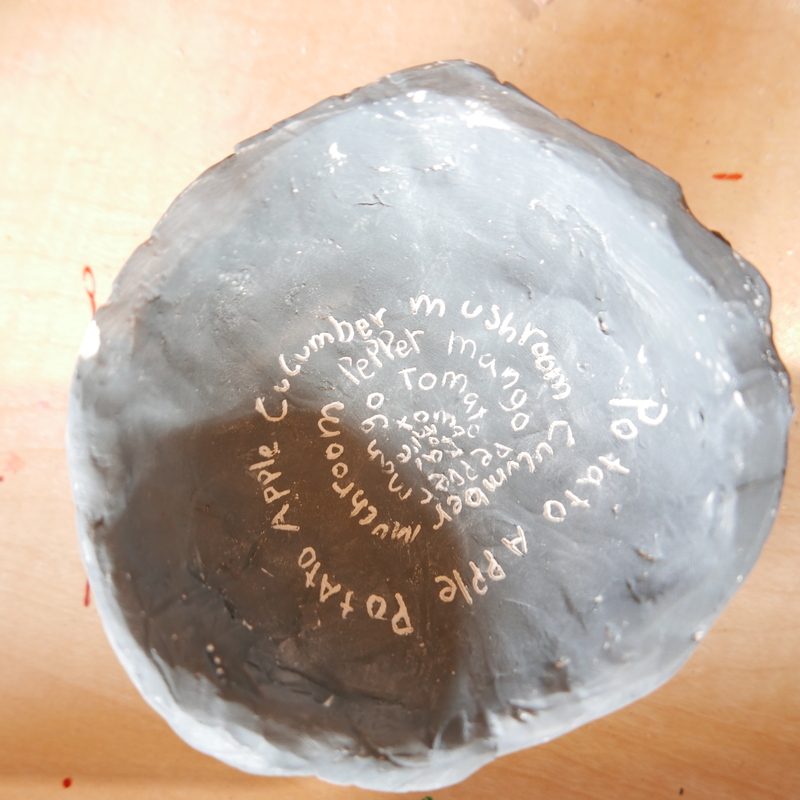 They then created 5 functional pieces of pottery, on which they etched, using the sgraffito technique. 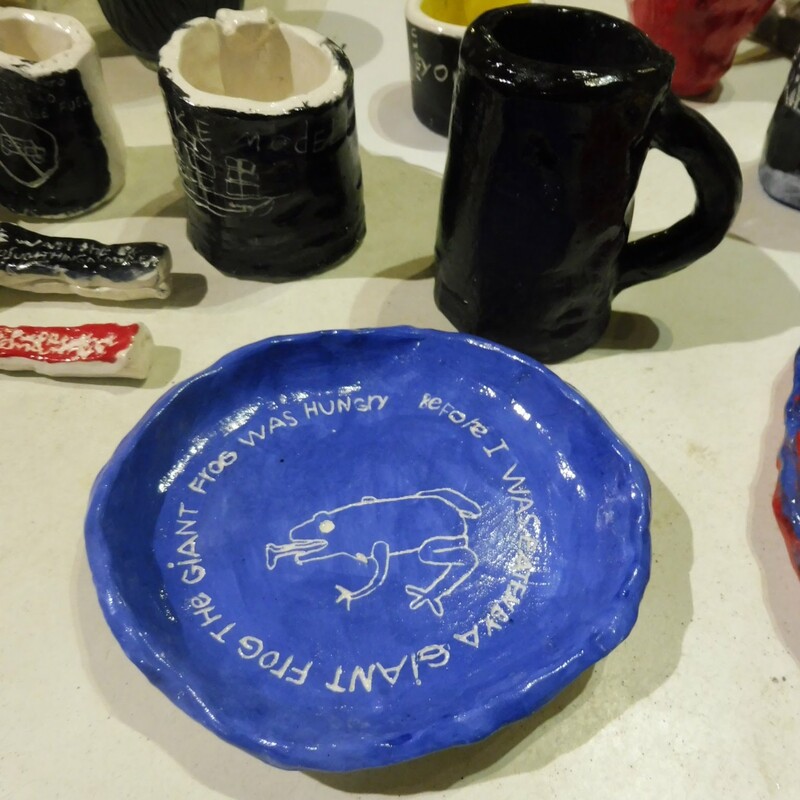 Starting with individual lines of their poems, the young artists translated verbal language into visual language, creating a place setting which could be rearranged in different settings, making mix and match pottery poems. This exercise challenged the artists to formulate imagery that was as specific as their words: no mean feat! For the younger artists, some in the 7 year old range, making the leap from verbal to visual was a struggle, though they were able to write their poems on the pieces, and had a ton of fun creating useful, functional pieces. For the older artists, in the 10-12 year old range, the concept came easily, and their illustrations highlighted specific points in their poetry lines, illuminating their intent, adding focus and emphasis. All of the poems, read aloud during a sharing period at the end of Brian’s time at Sweetland, were insightful and important, the young poets finding their voice easily, conveying thought and emotion beautifully. I was struck by the powerful way that the younger students looked up to the older cohort, striving to match them in the quality of their products. I was also struck by the kindness of the students, the emphasis on community, collaboration, sharing, and creative expression at Sweetland. Real learning and growing was evident at every step! I could see the children’s minds work as they sat molding the clay and thinking about how to visually describe the words of their poems. It was incredibly inspiring and exciting to watch how naturally art meshed with all learning. Thanks for sharing your very open and wonderful impressions. They are feelings I feel often and hope that others can experience too. That piece about being in the creative process and not know the road ahead or how we’ll get there is something that is so much a part of creative thinking and so scary for adults. It can be explored safely with the help of the children and I believe at the very heart of deep learning. When we don’t know where we are going I think we are on the right track because doesn’t that mean we are learning something new? Thank you all for trusting the process, believing in the arts and being able to stand back and see the magic the children have to offer, I think standing out of the way is sometimes the hardest thing to do. Not only did this residency exemplify why bringing outstanding teaching artists into the environment is so important but that every one processed the learning so the value of it became clear. A great big THANK YOU to Lindsay, Brian, Nina, Tim, Olivia, and the YOUNG LEARNERS for contributing to this blog post and for the great work they do every day as educators! I am so not surprised that this was such a success! This is how all schools ought to be!